Hong Kong movie, A Witness Out of the Blue <犯罪現場>, finally concluded filming. Working together for the past three months, the cast was thrilled and popped champagne to celebrate. 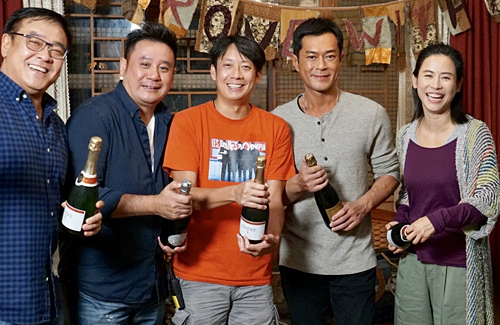 Although the celebration occurred late in the night, Louis Koo (古天樂), Jessica Hsuan (宣萱), Philip Keung (姜皓文), Evergreen Mak (麥長青), and Power Chan (陳國邦) were there. A Witness Out of the Blue is produced by Derek Yee (爾冬陞) and directed by Fung Chi Keung (馮志強). Jessica’s acting is so overrated. I don’t understand why she is more popular than Ada Choi. It’s fine. Ada is more popular than Jessica in China and in Hong Kong. The only advantage Jessica has is that she had a friend Louis Koo who will be helping her. It’s a bad signing by Louis in my opinion if he is looking for a regular movie actress. There’s more value in promoting a younger actress into a superstar than take in an older actress who is past her peak…. @anon Ada Choi’s acting is so OTT. Too bad Louis isn’t looking for someone nearing the age of 50 such as Jessica. Wouldn’t be surprised that Louis comes out like Andy in the future, in a long term secret relationship and married. He seems like that kind of guy….. But wouldn’t that be revealed by the media already? There are few secrets that can be hidden as an A-list celebrity, something as obvious as a relationship/marriage is quite difficult to hide. @jimmyszeto unfortunately though I hope it’s not true. Apparently he is still hiding in the closet. No evidence of that whatsoever. Louis has had no rumours with specific men.